Kreative Jewels: Five Days Until the New Release! Thank you for joining me as we count down to the next MFT release. We are five days away from the big day! All the new Stamps, Die-namics, and Stencils will be available on Tuesday, January 6 at 10:00pm EST. Be sure to check out the MFT Blog to see all the new items being revealed today. Don't forget to leave a comment on the MFT Blog. Countdown posts, YOU could win one of the five $75.00 gift vouchers. We have another AMAZING release in store for you this month. Besides all the fabulous stamps, Die-namics, and stencils, we are also adding six gorgeous new colours to the replenishments line. I used three of these colours, Lemon Chiffon, Lavender Fields, and Ripe Raspberry, for my first set of projects today. I couldn't wait to get working with this gorgeous trio of colours, so I grabbed the new Tag Builder Blueprints 3 Die-namics and made a few Valentines. 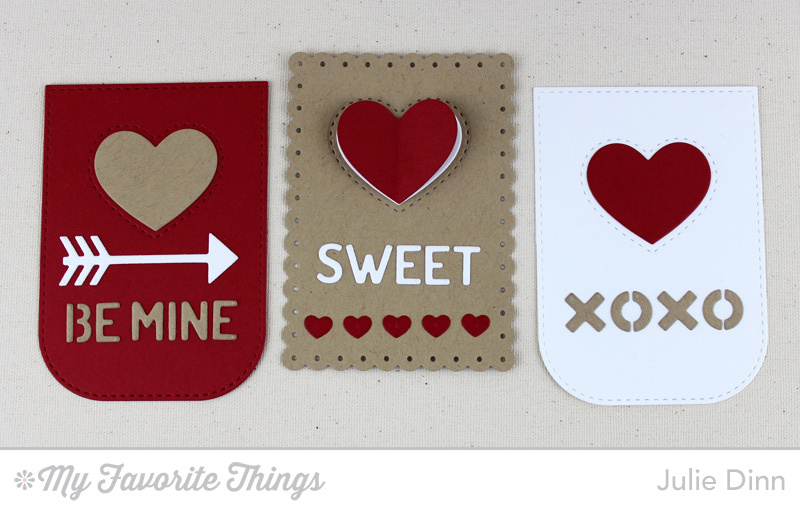 This new Tag Builder Blueprints includes two large tags, lots of hearts and sweet words. For this first collection of tags, I embedded all the pieces in the tags. Each tag is two layers. I die-cut the pieces from one tag, and then adhered that tag to a base tag. The little pieces were then placed inside the die-cut holes. 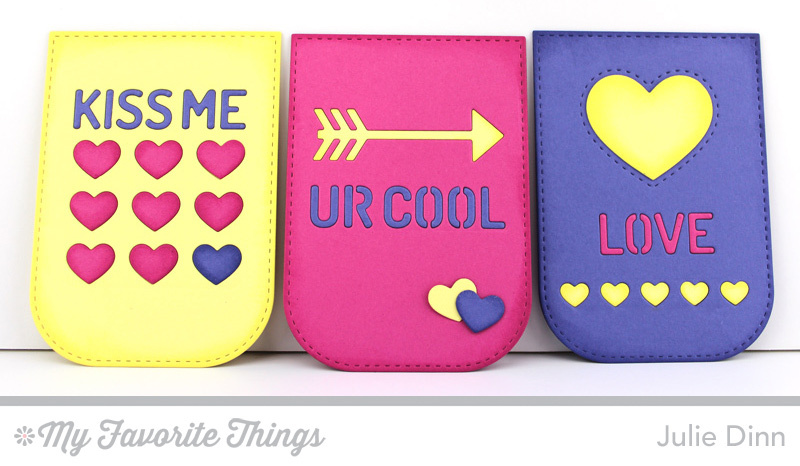 There are a few fluttering hearts and the two small hearts on the UR cool tag that are adhered on top of the tags. All of the tags and all of the hearts were treated to a little ink on the edges with the fabulous Premium Ink Pads and the Mini Ink Blending Tools. My second set of projects features the same Tag Builder Blueprints 3 Die-namics in a different colour scheme. 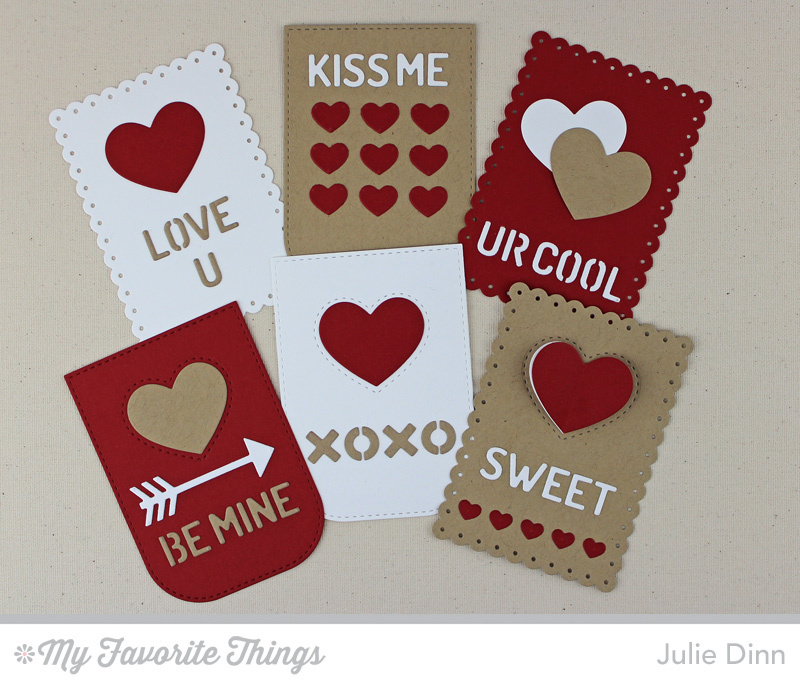 For this set of projects I used the new Cherry Crisp, Kraft, and Smooth White card stock. These sweet cards were much quicker to make than the first set as all the elements are simply adhered on the top of the tags. Whenever I die-cut small items like the letters of the small hearts, I always adhere a piece of Scor Tape to the back of the card stock before I run it through the Vagabond. This saves me from having to fiddle with glueing the tiny pieces. Accessories: Mini Ink Blending Tool, Scor-Tape 1/2"
Great tags, and thanks for the tip about the score tape. Love the tags using the new colors - they are beautiful. Was so nice seeing you when you were here. Happy New Year. Great tags and cards...Love the new colors!! Absolutely fun, love all your projects! Love the colors and all the projects you created! These colours are nothing short of delicious . The richness makes them so yummy.Love the Blueprint. Those new colours are fabulous!! Both sets of these are just awesome!! Your little creations are just SO CUTE! I love all the details with these dies. So many fun cards. Love the new release. 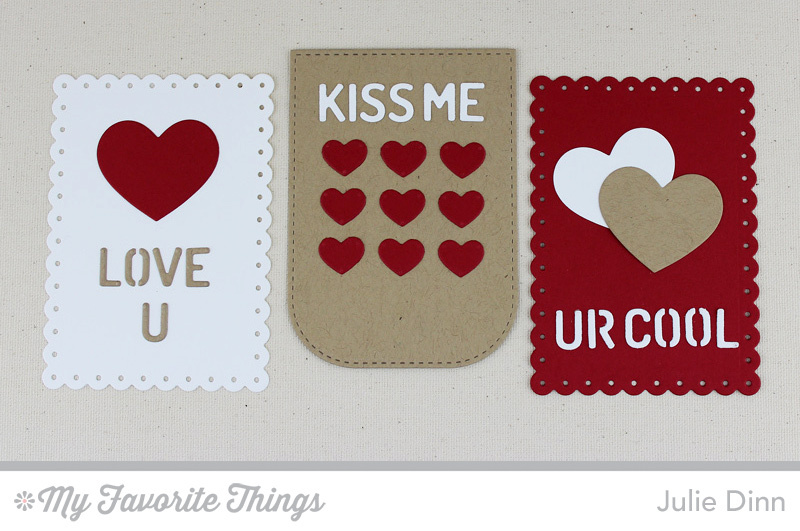 Great cards, so many ideas for valentine cards. 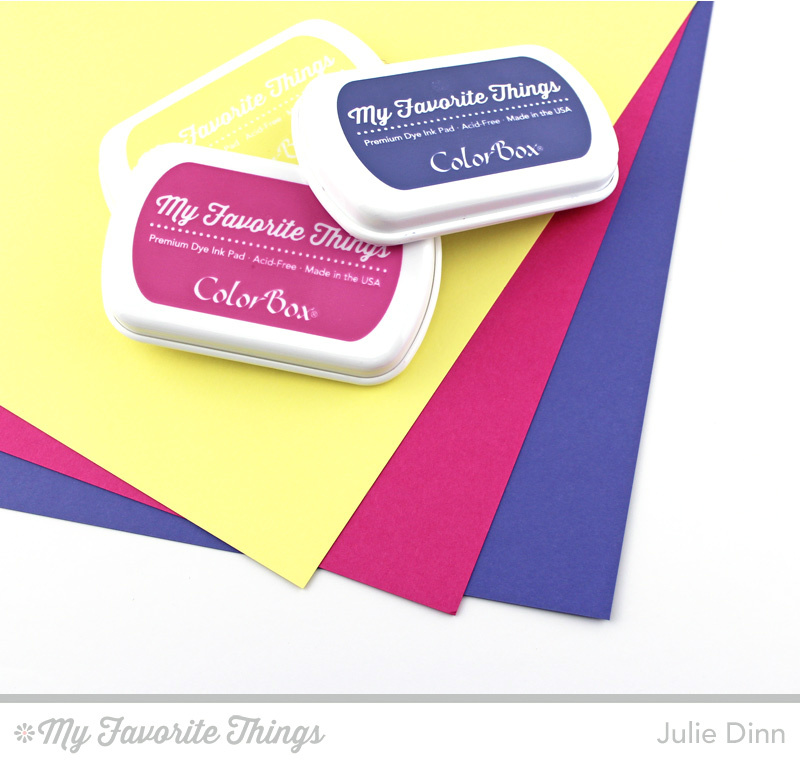 Love the new colors and your color combinations! Fabulous color choice for the first tags, looks so lovely!!!! These are all adorable! Love the color combos you chose. It was great meeting you recently at the boutique!!! And now I can post again thanks to the help of my DIL. OMG! What colorful and cheerful goodness with those first set of tags. Love It! The other are just as cool in the more traditional style. Now you've given me ideas for both. Bravo!